Asahina & Wallace, 9781940412047, 272pp. "A lovely and passionate evocation of a time and place and the evanescent self we all inhabit." - T.C. BOYLE Philadelphia in the '50s: Barson's Soda Shop at 60th and Cedar was the center of the universe, hanging out was the point, and the height of cool was to be kicked out of the Cedar Theatre for public displays of passion. 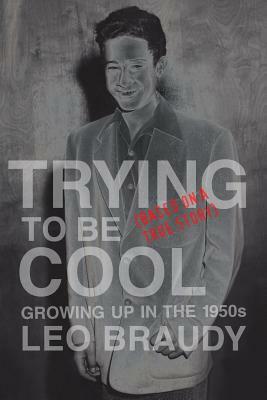 In this engaging memoir of teenage life amid the transformations of post-World War II America, Leo Braudy reveals his younger self as a somewhat clueless narrator in the throes of deciphering the innuendo and subterfuge of a confusing world. Was rock 'n' roll really a Communist plot? Was "juvenile delinquency" actually a threat to social order? Was "conformity" truly the era's norm? Weaving a personal narrative through the wider social context of disillusionment and apocalyptic fears, Trying To Be Cool reveals the vibrant eclecticism of a decade too often dismissed as a period of conventionality. "I love this book. The irony of Trying To Be Cool is that the book is so damn cool. It's Rock Around the Clock for smart people. Leo Braudy captures an American moment. This book distills and extrapolates at once. Braudy can play lead and rhythm at the same time." - PERCIVAL EVERETT.